Winter is just around the corner, and you are probably hearing a lot of home heating tricks from your friends and neighbors by now. As a heating and cooling professional in New Albany, MS, we’ll be cracking down these myths and share with you some home heating facts that you need to know this cold season. Myth #1: Cranking the thermostat will heat the home fast. Everyone is guilty of turning the thermostat setting too high, especially when the temperature drops and you began to shiver. You probably think that this is the fastest way to heat the room and feel warm but sadly, it is not the real case. Furnaces have a constant rate of delivering air in your home and cranking the thermostat will not help in heating your room fast. Instead, it will only let your furnace work longer and consume more energy to reach the temperature set in it. Myth #2: To save money, close the registers and vents in unused rooms. If you think that by completely closing the vents and registers you can save some cash, you better think again. Closing the vents and registers will cause pressure imbalance which creates stress to your unit’s operation. As a result, your furnace will work harder in heating your home. Myth #3: Reviving old furnaces to save cash. Do not wait for the furnace to break before finding a replacement. If your furnace is old and keeps on breaking down, you need to get a new one for your home. Old furnaces are less efficient and are prone to expensive repairs. If you keep on fixing it, you are most likely to spend as much money as you will need for a brand new unit. Myth #4: A high-efficient furnace alone will reduce your heating bill. To achieve maximum savings on your heating bill, you need to pair up a high-efficient furnace with proper insulation. If your home is poorly insulated, it will let the warm air escape which is more like seeing your money wasted. 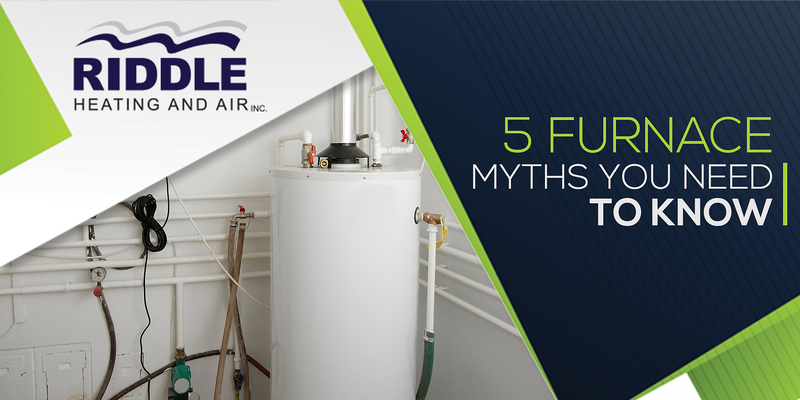 Myth #5: Bigger is better for furnaces. Size matters when it comes to the HVAC systems. Choosing the biggest unit will not guarantee the best results. Instead, you might be faced with expensive system repairs, poor comfort, and tremendously high energy bill. Orient yourself with these home heating facts and enjoy a wonderful season with your family. For more helpful home heating tips, visit our page or call our professionals at Riddle Heating and Air Conditioning, Inc.
« What Are The Dangers of Dry Indoor Air?